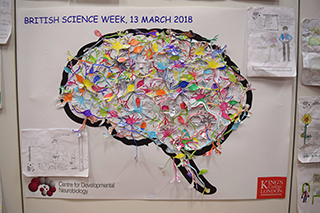 For the third consecutive year, the Centre for Developmental Neurobiology celebrates the British Science Week, a ten-day celebration of sciences and their importance in our everyday lives. 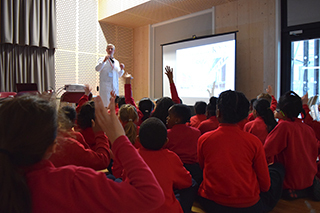 This year, we took our Glow in the Dark Science roadshow to three different schools: Charles Dickens Primary School, St George's Cathedral Catholic Primary School and Michael Faraday Primary School. Throughout each day, nearly 150 pupils aged from 5 to 11 took part in a series of practical and fun activities around the use of fluorescence in modern biomedical sciences. At the beginning of each session, scientists introduced themselves and their working environment. Then they asked questions like: Where do we come from? How is the brain put together? And how we can best study brain cells and their myriad of connections? Making cells glow is the key to being able to see, follow and study these brain cells in the laboratory. Fluorescence is visually appealing and can easily be detected using adequate equipment. With our Glow in the Dark Science project, scientists made the use of fluorescence accessible to children and brought the concept directly to their schools. During the day, children progress through four different 'activity stations' where they learn what neurons are, observe fish and fruit flies through a microscope, try their hand at keyhole surgery and observe everyday life objects that glow in the dark! This workshop couldn’t have happened without the help of over 20 volunteers from the Centre: Sarah Bartolme, Esther Bell, Kinga Bercsenyi, Louisa Boddy, Hannah Bruce, Enrico Buonaura, Triona Fielding, Pat Gordon, Fursham Hamid, Rachel Jackson, Clemens Kiecker, Fong Kuan Wong, Alina Letzel, Guilherme Neves, Martyna Panasiuk, Vicky Rook, Linda Van Keimpa, Tristan Varela, Leigh-Jane Wilson and Karen Yap. This project was supported by a grant from the King’s Public Engagement small grants fund .